International Women’s Day is March 8 and is an important day for women all over the world. 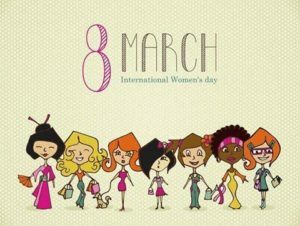 A day not only to celebrate women and their achievements in social, economic, cultural, and political platforms, but also to spread awareness and a call to action to push society to make it fairer and more inclusive for women. The Women’s Movement has been an powerful crusade in American culture as well as across the world. IWD first began unofficially in 1908 when women marched in the thousands in New York City demanding voting rights, better pay, and shorter hours. In 1975 the first ever official International Women’s Day was celebrated by the United Nations and two years later was adopted by the General Assembly as Women’s Rights and International Peace Day where any member state could honor their own Women’s Day any day of the year in relation to their own country’s history. Today we see the positive effects of International Women’s Day and the Feminist Movement as women are now represented in corporate boardrooms, have hit milestones in legislative rights, and we see many female public figures like Sheryl Sandberg, Oprah Winfrey and Gloria Steinem inspiring women everyday. This year, women in America are wearing red to the workplace to show their support, and those who are able, are taking the day off to celebrate A Day Without a Woman. Much has been done, but there is so much more to do. There is still a striking imbalance of women in leadership in business and politics, a gap in salaries between men and women for equal work, and the health, education, and safety of women is still being compromised around most of the world. Our duty, as women, is to ensure a brighter tomorrow for the future generation of females. In addition to marching for equal rights and equal pay, we can also send letters to our political representatives to enforce change. We also need to collaborate and support one another in our local communities and our everyday lives, not just on International Women’s Day.